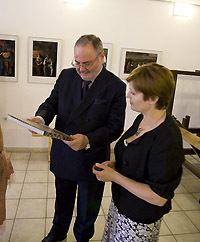 On June 23, 2010 Rodovid Press, together with the French Cultural Center in Kyiv, launched the new monograph Hutsul Embroidery at the Ivan Honchar Museum. The book is published in full color, and is available in three languages, Ukrainian, French and English. Hutsul Embroidery is the first publication of its kind to present the panorama of the most typical examples of Hutsul embroidery as embodied in the collection of the Y. Kobrynsky Museum of the Folk Art of the Hutsul and Pokuttia Regions (Kolomyia, Ukraine). The reader is presented with unique creations that mesmerize one with the beauty of their composition and ornamental motifs, as well as with the clarity of the artistic and aesthetic characteristics of these works. The motifs are ancient symbols that have survived to the present day in various interpretations. 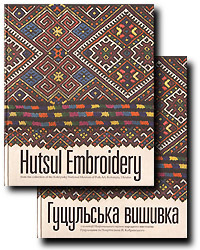 The essayists invite the reader to explore the art of Hutsul embroidery in all aspects: historical, cultural, artistic, utilitarian, and ritual. Hutsul Embroidery is made possible through the initiative of the French Ambassador, Jean-Paul Veziant, and his wife, Ellen, in cooperation with Ukrainian scholars and museum professionals: Olena Nykorak (Editor), Danylo Dmytrykiw (English translation) , Lubow Wolynetz (English language Editor), Yuri Bilak (photographs, Paris). Design by Iryna Pasichnyk (Rodovid).